The makings of a damn fine salad. Even though I’m back to the dairy wonderland that is my life, I’ll be keeping a few of the things I picked up during my brief stint as a vegan. Tofu cream cheese for, example, and veggie breakfast sausages are sticking around, as is hopefully the Spicy Sabzi from trendy salad chain, Sweetgreen. The Spicy Sabzi, mmm mmm mmm! I know what you’re thinking. A salad? Really? Yes, really. 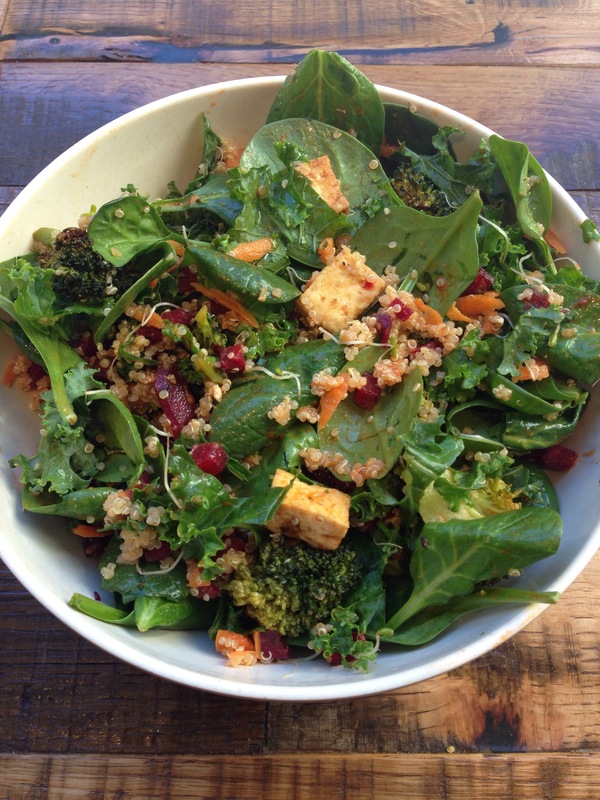 The Spicy Sabzi, a colorful, delicious and actually filling beauty of baby spinach and kale with spicy quinoa, spicy broccoli, carrots, raw beets, basil, sprouts and roasted tofu, is no freakin’ joke. Dressed with a carrot chili vinaigrette and a squeeze of one of my favorites ever, sriracha sauce, this salad is something I’d gladly eat again and again. It’s chunky, spicy, zesty and full of great tasting and great-for-you ingredients. What’s not to love? My one concern was that because Sweetgreen’s only New York location was in a part of town that I don’t typically find myself in often I probably wouldn’t be eating there that much, but then I read that another Sweetgreen is on its way to Brooklyn, not far from me, so it looks like there are definitely more Spicy Sabzis in my future. Vegan or not, I’m looking forward to that. DNA is about where the similarities end between my sister and me. She’s loud and sassy. I’m quiet and sarcastic. She says I dress like Mr. Rogers. I say she dresses like a hoochie. She drives fast with the music up and the windows down. I prefer to walk. And now, because life’s dealt her a particularly bad hand, we don’t even eat the same. Because of a serious health problem she’s developed in recent years, my sister— brace yourself cause it’s ugly —is on a sugar-free, fat-free, wheat-free, gluten-free, vegan diet. I kid you not, folks. My heart breaks a thousand times for her. No sugar, fat, wheat or dairy. That leaves what, air?? This presented major food problems for my visit to Miami. We’d be going to eat but where the heck could we both go? Uhm. No. Not happening. Not on my watch. I turned to my vegan and vegetarian friends in Miami, and found just the place: Metro Organic Bistro. With the beau and our mother also with us, we set out for the design district eatery that boasted lots of fresh, organic, healthy and vegetarian friendly options. I’d be lying if I said I wasn’t a tad bit skeptical. I can’t help it. It’s the sugar-crazed, fat-loving carnivore in me. 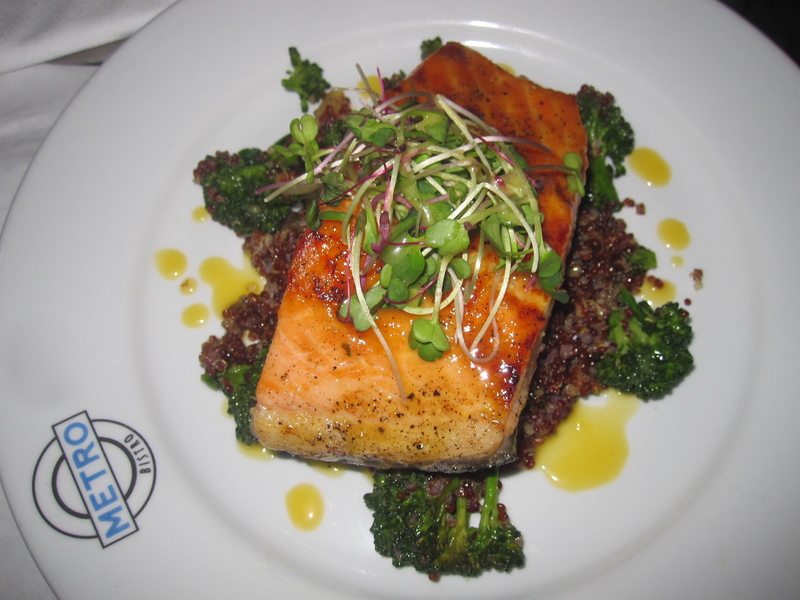 But Metro Organic Bistro, I’m happy to say, completely floored me. If this is what being super healthy was like, sign. Me. UP. 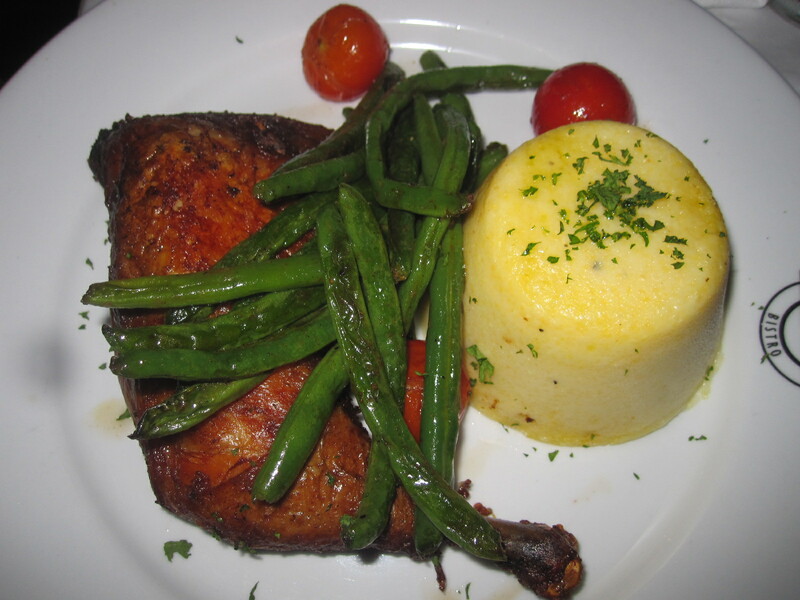 My mom ordered the braised chicken (free range and natural, thank you very much) with truffled polenta and organic green beans. The polenta wasn’t as creamy as I like it, but the truffle flavor made it buttery and smooth. 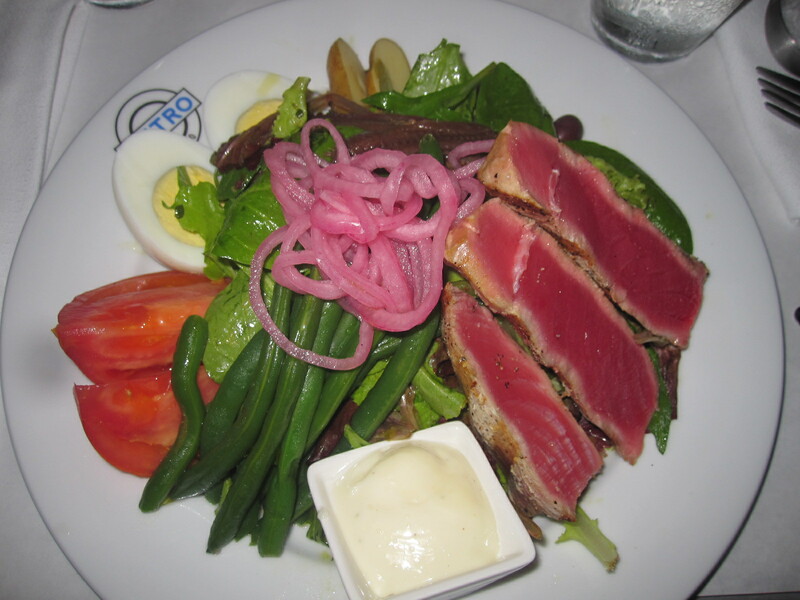 My sister ordered the tuna Nicoise, though not a vegan option (hey, she’s new to the game). Fat, juicy hunks of yellowfish tuna came on a bed of organic greens, potatoes, tomatoes, green beans, boiled eggs, onions, Nicoise olives and anchovies. She doesn’t like anchovies but I do, so guess where those little guys wound up? 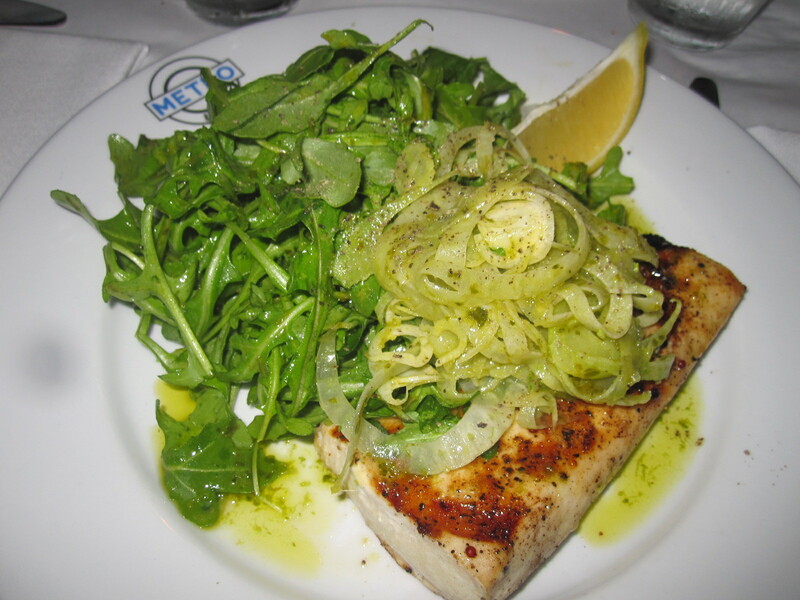 I went for the Mahi-Mahi, a tender, juicy, lemony, grilled (and wild caught) steak topped with shaved fennel and watercress, topped with a zesty cilantro drizzle. 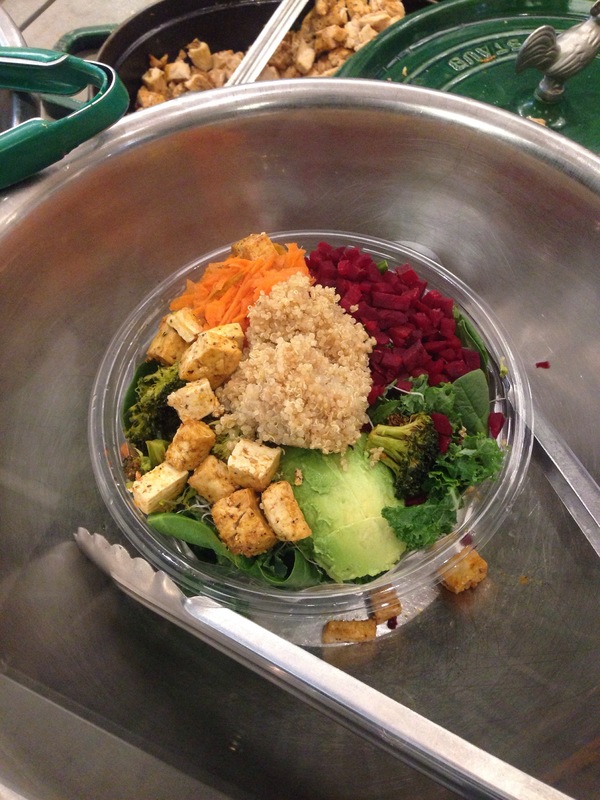 Everything was organic, but more than that, everything was vibrant, colorful and crazy delicious. Last but not least was Flaneur’s. He opted for one of the specials not listed on the menu: a plump and wonderfully juicy and smooth piece of salmon, so perfect it seemed to just melt on your tongue. Underneath it was a mound of red quinoa and broccoli florets, to lend it an earthy, veggie goodness. And because no meal, healthy or otherwise, is every complete without dessert, we got two to share amongst the four of us, though I’m pretty sure the boy and I did most of the damage. 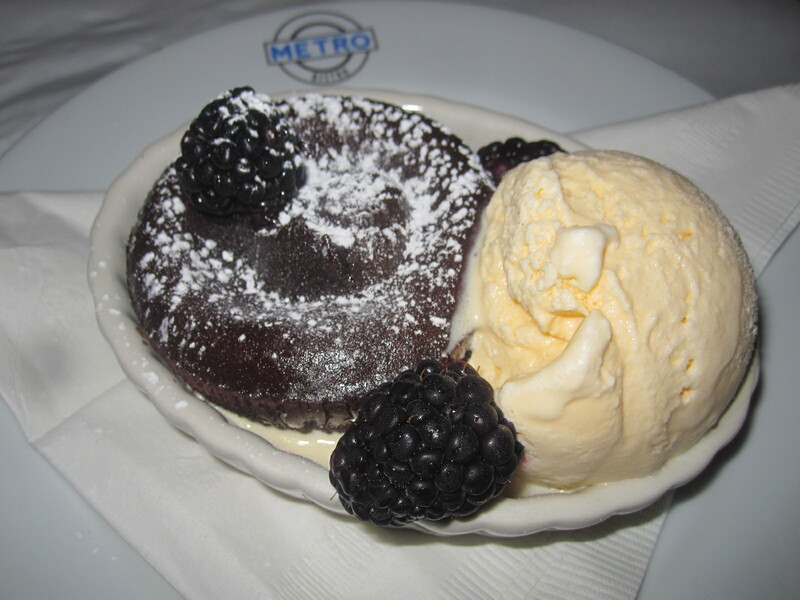 First was the chocolate bouchon a la mode, a warm chocolate lava-cake paired with a creamy scoop of vanilla ice cream and topped with some of the fattest blackberries I’ve ever seen. When the gooey, warm chocolate inside poured out, it was like dying and going to healthy food heaven. Our other dessert was another special not on the menu: a fig tart with mascarpone and more juicy blackberries. 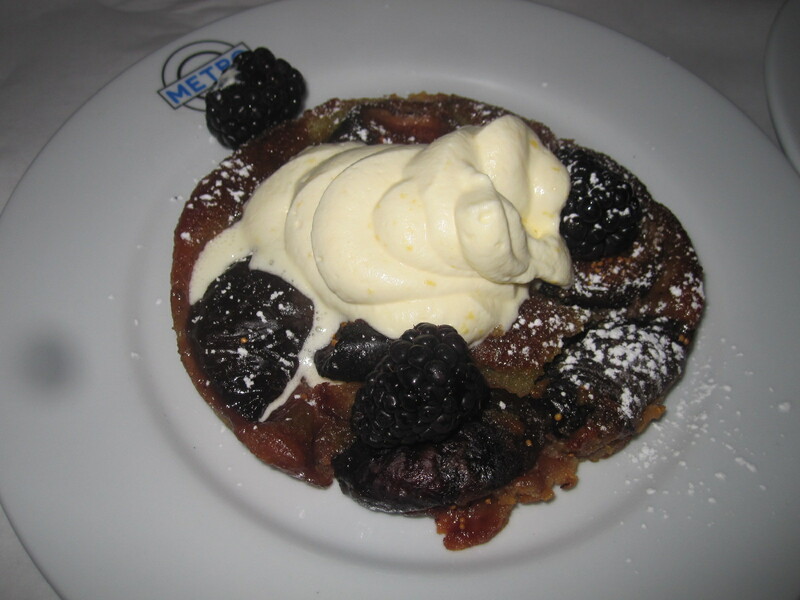 The tart was sweet and nutty, with a taste reminiscent of roasted chestnuts, and fat little chunks of figs throughout. Being the fig-fiend that I am, this was perfect. In the end, there was no pork belly or lard, nothing deep fried or oozing with cheese, but everything was delicious, clean and healthy. And that’s something my sister and I, different as we are, both agreed on.